Tats Nkonzo is a South African stand-up comedian, musician and television personality. As a Top 24 finalist in the third season of the M-Net reality competition, Idols (2005), and as a top 8 finalist in the SABC1 reality competition “So You Think You’re Funny!” (2008), Tats Nkonzo has managed to harness and integrate comedy and music to exhilirating effect. With a massive arsenal of observational humour, cutting intellect and a guitar, Tats brings a flavour to stand up comedy that is unrivalled. He is known for his musical segments on the fourth and fifth season of the Emmy Award nominated, satirical news show Late Nite News with Loyiso Gola. And is currently the host of SA’s Got Talent. 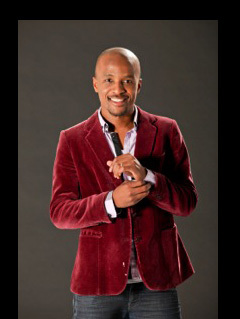 Tats Nkonzo made his Comedy Central debut when he hosted Comedy Central presents Tats Nkonzo Live at Parkers in 2013. Based on the content of Nkonzo’s material on stage, CNN’s African Voices conducted a profile on him (and Nik Rabinowitz) where the two had an opportunity to speak about South Africa and how stand-up comedy fits in the bigger picture of nation building. Also known as the host of the e.tv reality competition, SA’s Got Talent, in 2012, Tats Nkonzo is an artist whose ability knows no bounds. He received the BlackBerry Breakthrough Act Award at the 2nd Annual South African Comics Choice Awards, in 2012.